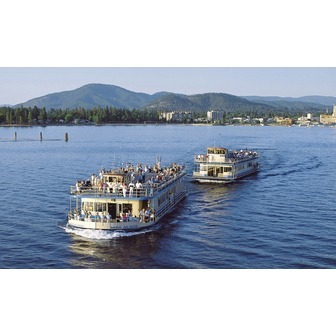 These fun and scenic cruises on Lake Coeur d'Alene depart daily from downtown Coeur d'Alene. You'll find many cruise choices to match your vacation or family outing, including Scenic Cruises,Sunset Dinner Cruises, St. Joe River Cruises, Brunch and Dinner Cruises or seasonal event and holiday cruises. For family activities on Lake Coeur d'Alene, take a daily cruise in the summer, or a Journey to the North Pole Cruise to visit Santa between Thanksgiving and New Year's. CdA lake cruises depart for all major holidays including the spectacular Coeur d'Alene Resort Holiday Light Show, as featured on Good Morning America. The two-deck Lake Coeur d'Alene Cruises boats are climate-controlled and have picture windows, sound systems, and full bar service, which help create a wonderful experience on the water. Lake Coeur d'Alene is known as the Playground of the Pacific Northwest for its scenic beauty, and the rail of a cruise boat is the best place to enjoy it. Lake Coeur d'Alene Cruises also offers romantic boat weddings, receptions and rehearsal dinners. If you want your own lake cruise boat, for family reunions, business functions or other special events, talk to our cruise specialists to reserve your boat event today. Enjoy your cruise on Lake Coeur d'Alene!